Thanks to SynapticSim who requested the two claw mesh and created the clothing and modeled out the character. 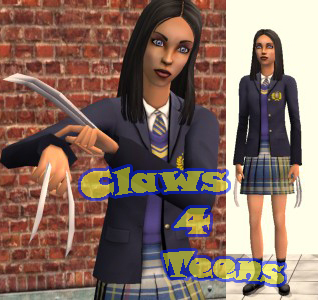 (All I did was the claws, so thank you for all your hard work and allowing me to post it with my mesh) Visit his site for all his sims products. X-23 was born within the walls of a Hydra compound. Hydra had stolen documents from project Weapon X, and they used these documents in the hopes of creating the perfect weapon. Dr. Deborah Risman was one of the lead scientist on the project, and she failed 22 times. Using Wolverine's DNA, she finally succeeded with a few minor changes, most obviously the lack of the Y chromosome. 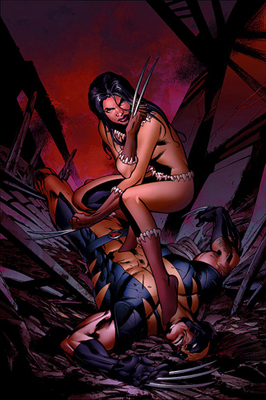 Dr. Risman implanted herself with the embryo, and nine months later, X-23 was born. 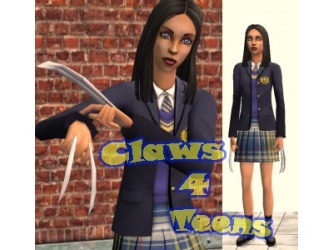 Her mutant abilities of a healing factor, heightened senses, and two bone claws on each hand, manifested themselves at the age of 12. At this time, she was put through the Weapon X process, and the metal adamantium was laced to only her bone claws, not the rest of her skeleton. Hydra's attempts to breed out all emotion failed, and they were left with a very violent teenage girl. Eventually, she was sold to whatever insidious faction held the highest bid. Not much is known about what happened to her between the time that she was sold up until she become a "call" girl in the area of Manhattan known as MutantTown. Eventually, she tracked down Wolverine, who she believed to be the reason for her troubled childhood. He was eventually able to talk some sense into her, and know she's currently taken up to Psylocke. Particleman's Wonderbra Heels Mesh featured on X-23. These characters and their costumes are not endorsed by or affiliated with Marvel Comics and/or Marvel Entertainment, or its licensors. Trademarks are the property of their respective owners. Costumes, Logos, and Characters copyright Marvel Entertainment, Inc. and its licensors. All Rights Reserved.